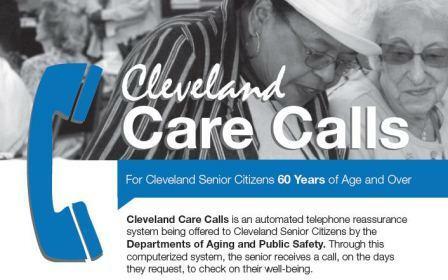 The Cleveland Care Calls program uses an automated phone call system to provide both a daily phone call to socially isolated older adults in the City of Cleveland and emergency alerts to a wider group of older adults in the city. The program aims to provide socially isolated older adults a daily wellness check and access to emergency services if necessary. The older adults choose the days they would like to be called and a closely monitored automated system dials each individual. A recorded message asks them to press 1 to confirm they are ok. Several attempts are made to reach the client. If there is no positive response, the Care Calls monitor makes a personal phone call to the individual or the individual’s emergency contact. When no contact is made, a wellness check will be conducted by the Department of Aging or Public Safety. Over 200 individuals receive the Care Calls daily phone call. The program resulted from a strategic planning process that included older adults on the planning committee. The program was implemented in collaboration with with other city departments including Aging and Public Safety. We know this program has helped older adults in distress who did not have way to communicate their needs. As a result of wellness checks, Care Calls has helped many older adults receive urgently needed medical care. It also provides peace of mind for both the older adult and their family members that once a day, someone will check to make sure they are not in distress. The Care Calls program also has a larger bank of phone numbers to use for the purpose of emergency notification. The emergency notification calls include a recorded message with guidance on how to proceed with the specific emergency. For example, during extreme heat, advice is given to older adults on how to stay cool, the signs of dehydration and heat stroke and a recommendation to contact 911 if they are experiencing life threatening symptoms. The call also recommends contacting 211 for non-life threatening situations. In early 2015, the emergency notification system was used three times during days of dangerously cold temperatures. This system could also be enacted if a citywide evacuation were to be necessary. The emergency notification system reaches over 37,000 older adults and is a crucial tool in the city’s disaster preparedness plan. Details on older people's involvement: The Care Calls program grew out of a strategic planning process. The Department of Aging's advisory council was convened to provide input throughout the planning process. Periodic presentations to the Advisory Council have been given on Care Calls and other departmental programs. Community presentations have also been made to increase awareness of the program among older adults and the wider community. From the target group we have learned they prefer a human recording as opposed to a computer recording. We have also learned that if a client misses a call, it is useful for them to have a number to call to let the Care Calls monitor know they are ok.
We will continue to enroll new older adults in the Care Calls program for the daily checks. We are looking at new ways to obtain the cell phone numbers of older adults who have given up their landlines for the emergency notification calls. We will also be looking into the feasibility of text message alerts for emergency notifications. Include an option for a direct link to emergency services on the initial call for the older adult to select if necessary. One challenge we have faced is the transition from landlines to cell phone lines and frequently changing phone numbers.